Father’s Day is just around the corner and we have just the perfect Father’s Day gift guide for all our adventurous Dads (and like Dad personalities) out there. It’s now time to honour all the special Dads who make us proud! Why not uncover the stylist in dad with some exciting new adventure wear that he’ll truly appreciate? Or send a warm Father’s Day message to your husband, partner, brother or friend with our expertly curated Father’s Day gifts for under $50. Paddy Pallin has you covered with gifts to suit all of Dad’s personalities – the go-getter Dad, the active Dad, the over explorer Dad, the ethical Dad, and the Dad who loves to sleep outside! No matter what forte your Dad rules, you are sure to find premium gift ideas that he secretly wants, and be sure to give the gift he’ll love! For those outdoor Dads who like to push limits, we want to enable their adventures while keeping them safe and comfortable! 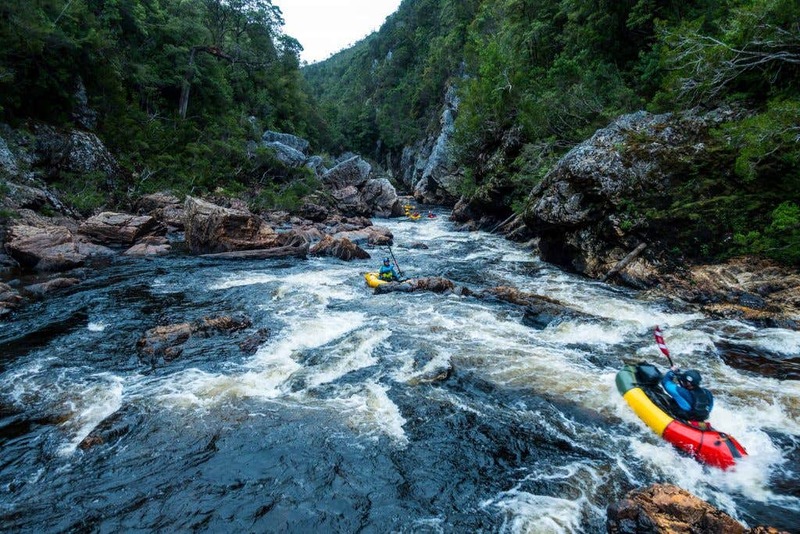 We’ve got a couple of adventure gift ideas that do just that. 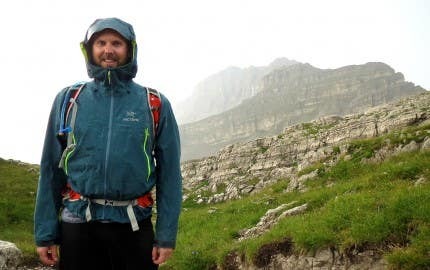 The North Face has come out with new technology that solves a common problem for many adventurers: heating up as you work, cooling off when you stop, layering up, then quickly becoming too hot again! 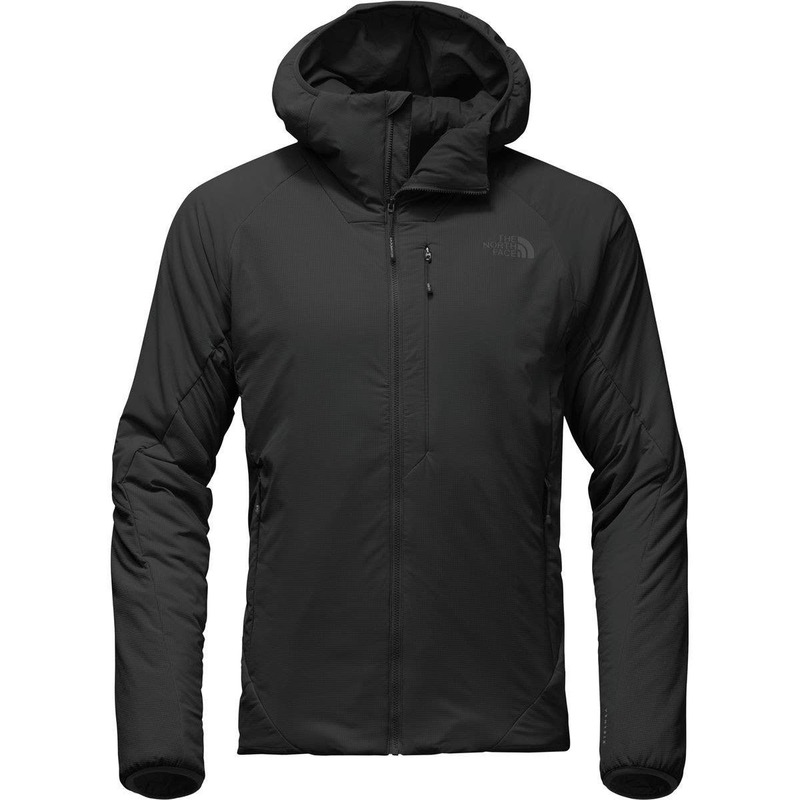 The North Face Ventrix™ Men’s Hoodie is a lightly insulated garment that features state-of-the-art Ventrix™ ventilation for balanced warmth and breathability. This technology features laser-cut perforations that expand when you move, effectively dumping heat to keep you cool, and that close when you’re still to retain heat and keep that body heat up. It’s effectively “the jacket that works when you do”. This new technology allows you to maximize warmth when you need it while balancing breathability when you engage in activity. Looking for a Father’s Day gift that your Dad can take anywhere? Give him a hand held tool with a myriad of functions to get whatever job done, no matter where he might be! 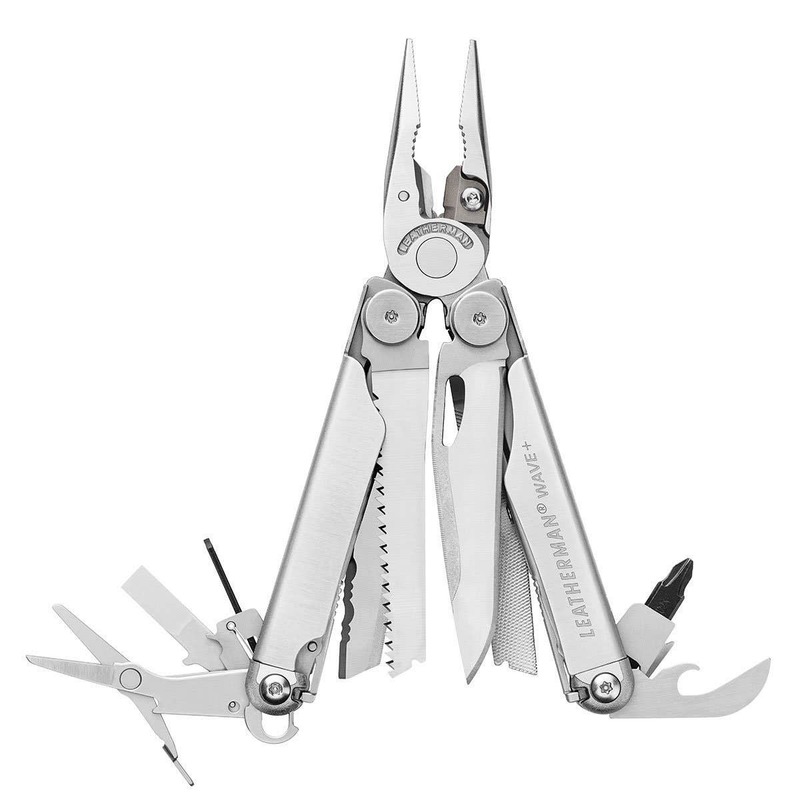 The Leatherman Wave Plus has all the essential tools of the original Leatherman with the addition of replaceable, durable wire cutters. This gadget features 18 user-friendly tools that can be opened and locked with one hand. An added bonus is that many of the tools live on the outside, and as such can be used when the tool is folded and closed. Keep your loved ones safe on the trails, in the waters, on peaks and in the backcountry. Satellite communication can save a life in times of accident or turning conditions. The latest SPOT Gen3 gives you a critical, life-saving line of communication using 100% satellite technology. When your adventures take you beyond cell service, SPOT Gen3 lets family and friends know you’re OK and has the capacity to alert emergency responders with your GPS location – by simply pushing one button. Unlike other personal locator beacons, SPOT allows for more than just calling for help in an emergency. With SPOT you can track your progress, check in with loved ones, and call for non-emergency assistance. This pocket sized device is easy to take along on any adventure, and includes features unique to the SPOT Gen3 like customized tracking and motion-activated tracking. The SPOT Gen3 also has superior battery life, with approximately twice the battery life of the SPOT 2 Satellite GPS Messenger! If the outdoor Dad in your life is always itching to get on the trails, in the water, in the saddle or do anything that makes him sweat, These gifts are perfect for you. A hydration pack is every athlete’s best friend – minimising bulk and discomfort that come with carrying bottles, while making staying hydrated as easy as possible. 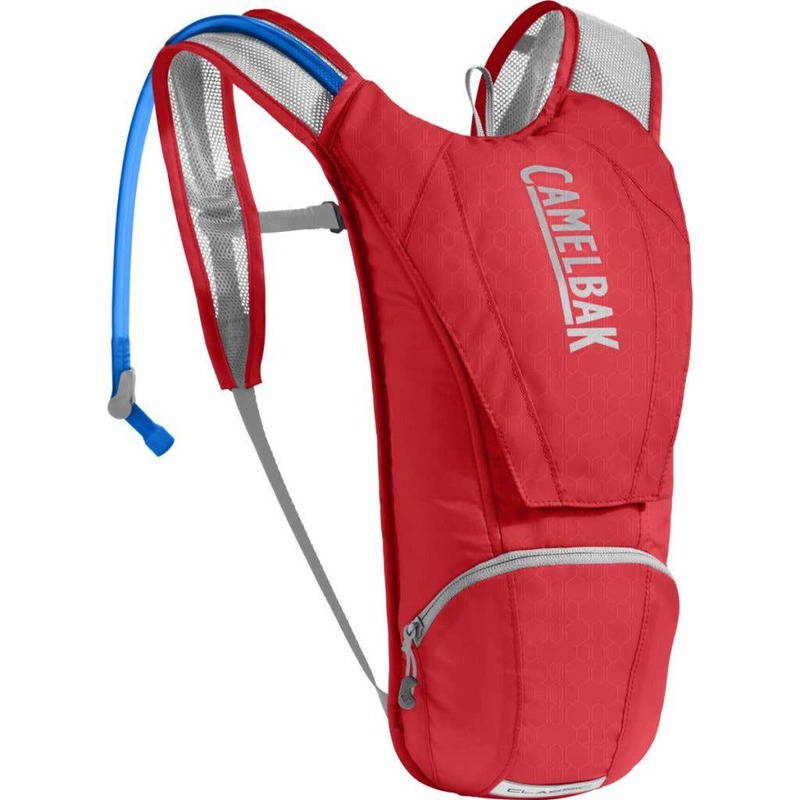 No need to stop and unpack with a hydration pack; keep your adventure Dad on the go for longer with CamelBak’s Classic 2.5L Hydration Pack. The technology in the new Crux Reservoir allows for 20% more water per sip in the saddle and on the trail. Here in Australia, it’s important we take care of our outdoor Dads when they are get active outside. We can do so with essential outdoor gear such as men’s hats, sunscreen or sunglasses. 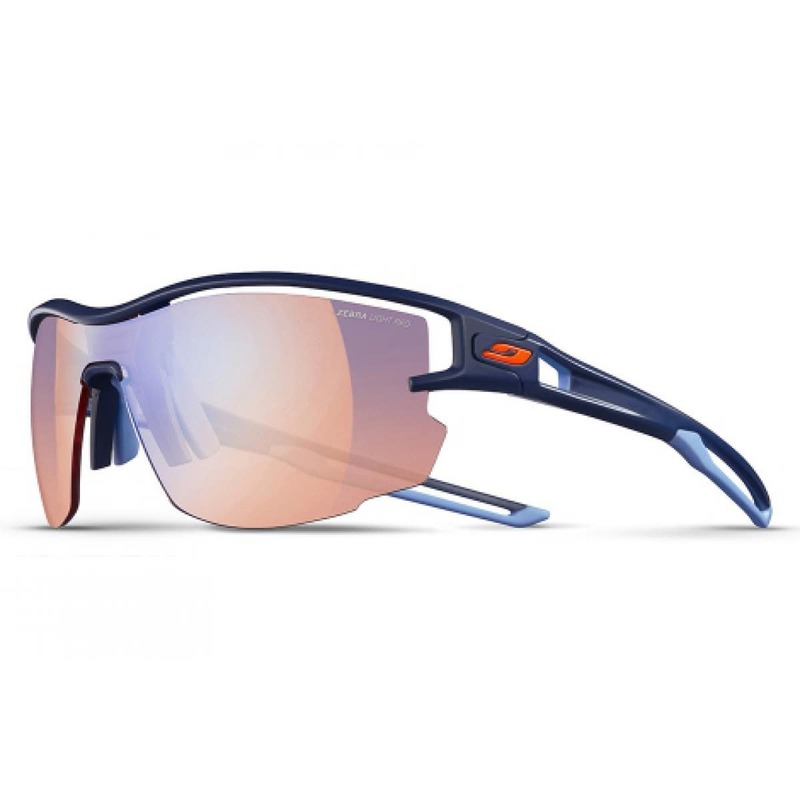 Paddy Pallin’s line of Julbo sunglasses offer a fantastic range of protection to suit the needs of all outdoor Dads, no matter the activity they’re taking on. Our pick for this Father’s Day is the Julbo Aero Zebra Light Red Sunglasses. These panoramic sunnies boast a wide lens surface make for a broader field of vision. These glasses are light as air, with an additional Air Link Temple System that provides added shock absorbency thanks to an elastomer insert at the end of temples for more comfort and lightness. The 3D Fit Nose’s special wingtips are adjustable in every direction to ensure a seamless fit on every individual nose and an unbeatable hold in all conditions. The glasses are designed with full venting in mind; their aerated structure allows complete air circulation to prevent inconvenient fog. The lightness of these glasses make them extremely versatile, portable and ready for any adventure! Shop the full collection of Julbo sunglasses at Paddy Pallin. You can never go wrong with jocks and socks! Stray from boring, sweat absorbing and smelly options like regular cotton garments, and look to top of the line options that are moisture wicking and odor repellent, making them more practical for your travel needs. The Exofficio Give-N-Go Sports Mesh 6″ Boxer Brief pairs ergonomic fit with ultralight mesh for active performance. Whether you’re cycling through Patagonia, trekking in Vietnam, or trail running in your home range, the Sport Mesh will keep you cool, fresh, and comfortable. Treated with Aegis® Microbe Shield™ to eliminate odor-causing bacteria in fabric, they remain a top option for quick drying and highly breathable jocks. Shop all Exofficio underwear options here. 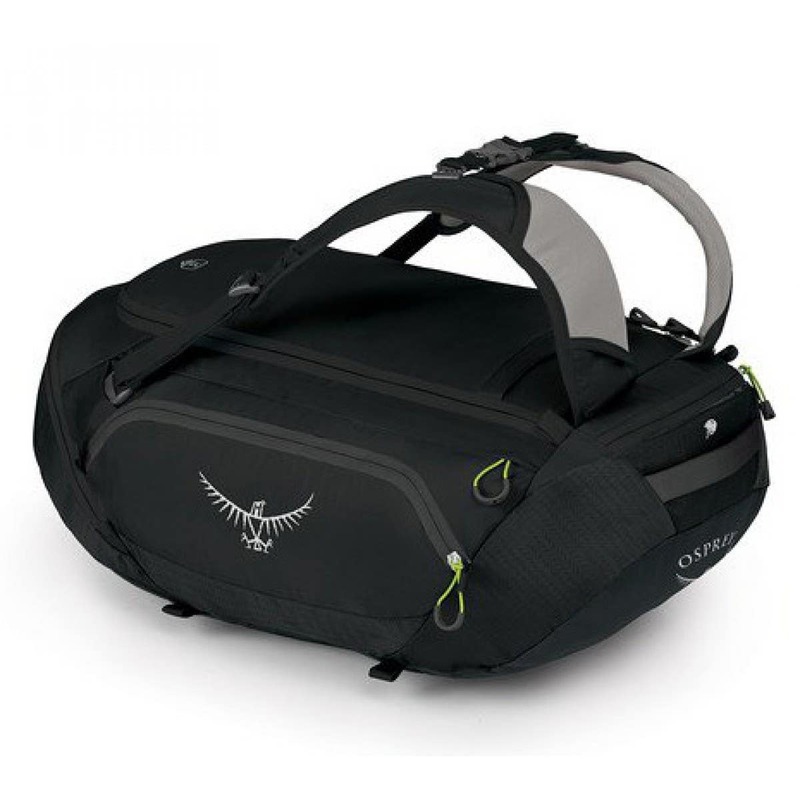 Osprey offers a wide range of travel luggage ranging from backpacks to duffel bags. Why not something in between? The TrailKit duffel sports smart features and function for not only travelers, but trail runners, mountain bikers, road cyclists, and athletes alike. For more gift inspiration for the outdoor Dad who loves to explore the world, have a look into our wide range of travel equipment including travel security, packing cells and pouches, and travel guides. Men’s Icebreaker Oasis Leggings are the perfect versatile gift for any Dad. 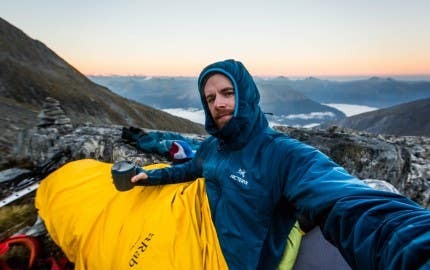 Their lightweight, soft, breathable and odour resistant properties make them the ideal piece of gear to bring travelling to colder destinations, on cold weather adventures or simply as an added comfort to overnight walks or camping trips! 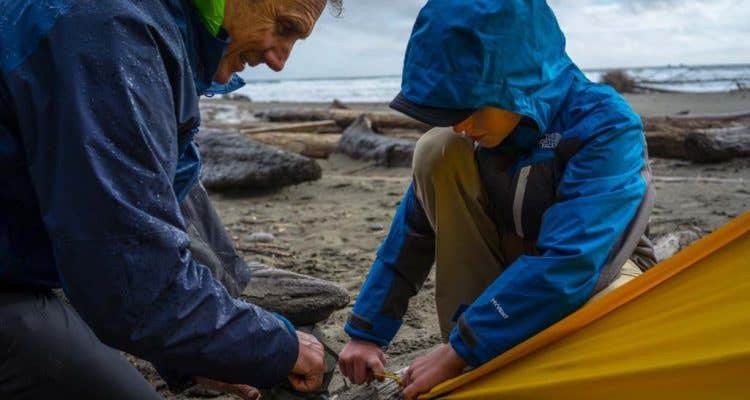 For the socially conscious Dad in your life, you can use your buying power as a customer to speak up and support the sustainable and ethical strides being made in the outdoor industry. 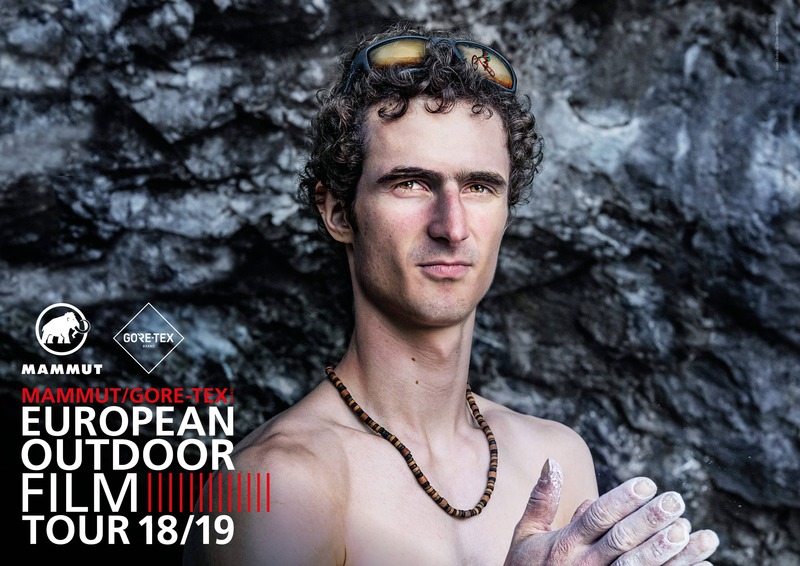 Icebreaker is an organisation that was founded with a purpose: to offer outdoor enthusiasts a natural alternative to synthetics and to disrupt the outdoor industry and encourage sustainable solutions in doing business. By nature, Icebreaker’s core material (merino wool) is a naturally biodegradable fiber. Under the right conditions, Icebreaker’s garments will biodegrade over time when buried. 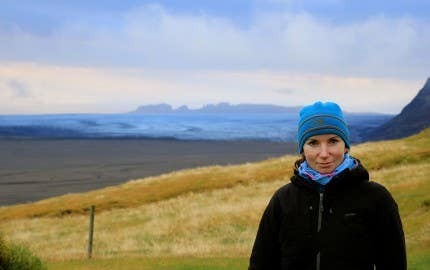 Since Icebreaker made the first tracks in using merino as a principle fiber for high-performance outdoor clothing, they have been able to develop deep, long-term relationships with merino farmers. These open relationships have fostered a high level of animal welfare standards and transparency among the moving parts in Icebreaker’s supply chain. Icebreaker commits to an animal welfare policy that ensures a healthy, low-stress quality of life for the sheep. Learn more about Icebreaker’s ethical supply chain and how they are trailblazing in the realm of sustainable business operations and transparency. It’s these foundational pillars that have landed them an A+ in this year’s Ethical Fashion report. If you want to read more about Icebreaker’s sustainability efforts, their Transparency Report is available to the public. Shop new arrival Icebreaker products at Paddy Pallin today. Spoil the ethically minded outdoor Dad in your life with some Icebreaker gear! Another great Father’s Day gift idea for the socially conscious Dad is purchasing a garment that supports a cause like Patagonia’s Fair Trade Certification Program. 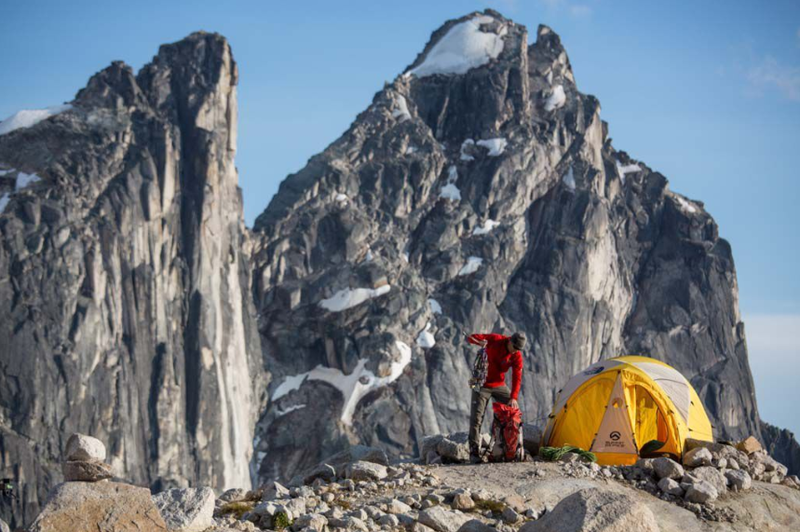 The collection of Patagonia Men’s Jackets will leave dad speechless. 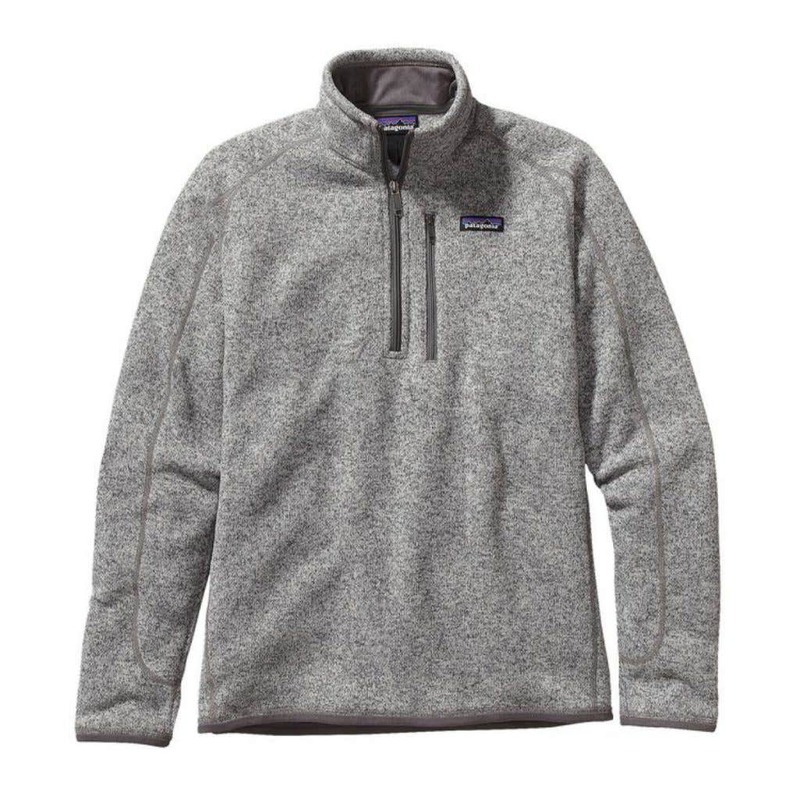 With special attention to the Patagonia Men’s Better Sweater ¼ Zip Fleece, as it is an easy-wearing, bulk-free quarter-zip made of knitted, heathered polyester fleece that’s dyed with a low-impact process that significantly reduces the use of dyestuffs, energy and water compared to conventional dyeing methods. If you’re wondering what Fair Trade is all about, here’s a little summary to get you in the know! Now, how does Patagonia’s Fair Trade Program work, and what’s so great about it? The program is simple: For every Fair Trade Certified™ item sewn, Patagonia pays a premium. These excess funds contribute to an account entirely controlled by the workers. This deviates from your typical top-down program: in each case it is run by a democratically elected Fair Trade worker committee. The elected committee then governs how the funds will be used, whether it’s for social or economic initiatives. This is not a top-down program, but one run in each case by a democratically elected Fair Trade worker committee that decides how the funds will be used, whether designated for social, economic and environmental community projects like private healthcare, child care centers, or as a cash bonus that gets workers directly closer to a living wage. 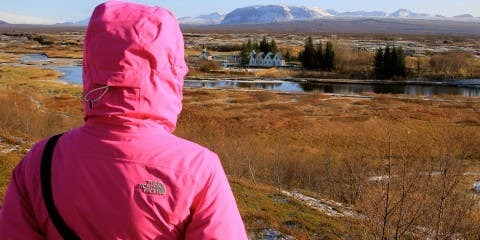 More than 15,700 workers have benefited from the premiums Patagonia has paid through the Fair Trade Certified™ program. Klean Kanteen is a brand putting their most sustainable foot forward. The California based reusable-bottle maker uses 100% renewable energy and 75% recycled material. 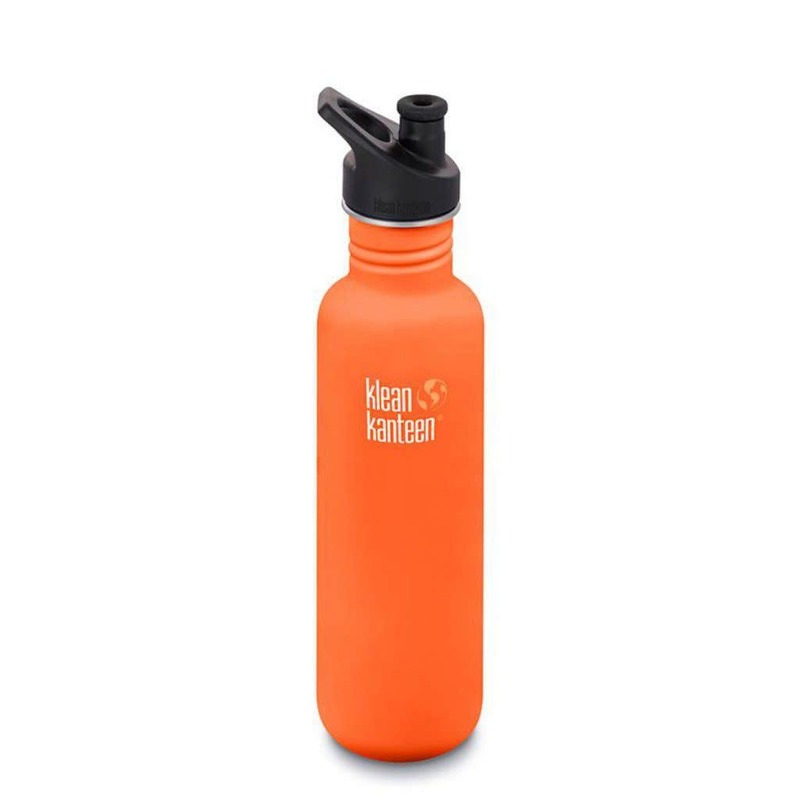 Give your Dad an easy, functional and stylish way to stay hydrated way on adventures or in his day to day life with Klean Kanteen’s Classic Sport Cap Bottle. For more gifts that can make it easy to ditch single use plastics, check out Klean Kanteen’s line at Paddy Pallin. If you’re looking for some non-material (zero waste!) 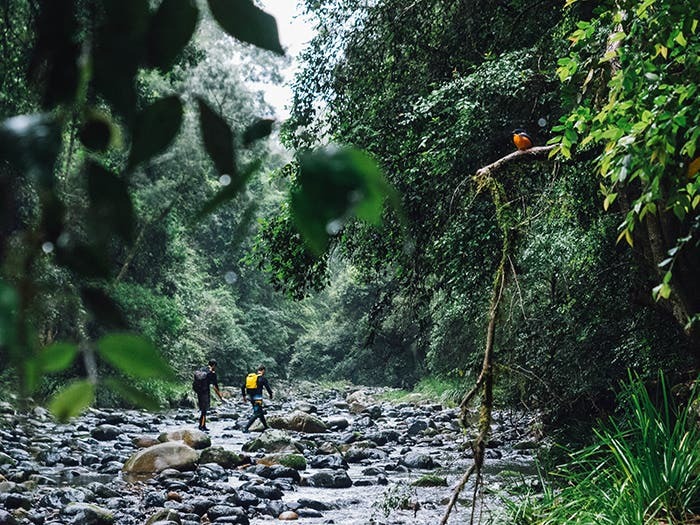 ethical gifts to light up your Dad’s Father’s Day, how about locking in some elements of your next adventure that he’s ticking off his list? 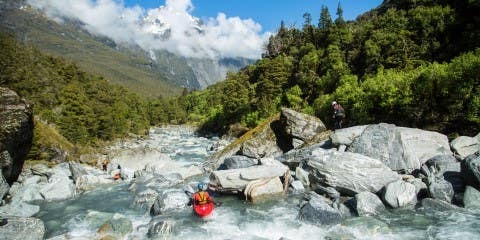 This could include booking campsites in an epic National Park you’re looking to explore, either locally or interstate! Looking to go overseas? 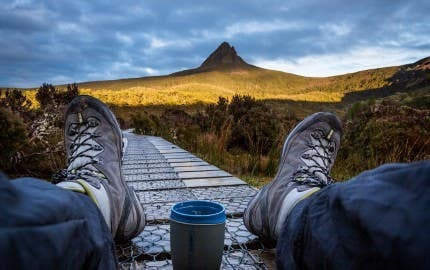 What about planning a special multi-day adventure and mapping that out for him in a card, or booking a few nights to camp or enjoy the huts along New Zealand’s Great Walks? 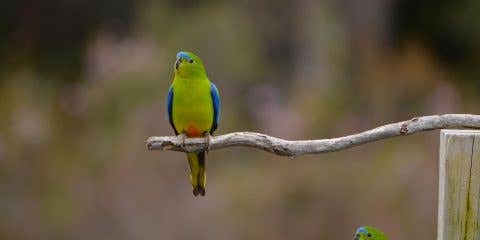 Show him you’re on board with his ethical passions by making a donation on his behalf to an initiative he supports – help Save Our Wild Rivers, build a conservation park like the Great Koala National Park, help regulate invasive species in Australia, or even take it international! A great way to merge a gift with an opportunity to spend time together would be to participate in an initiative together. Free up your Saturday and put it in Dad’s calendar! 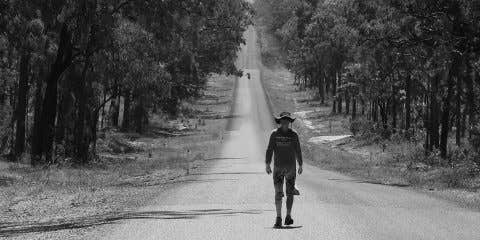 Events like the Seaside Scavenge are taking place all over Australia. Seaside Scavenge is a beach cleaning initiative with a twist, you can trade your collected waterway litter for treasure including vintage clothes, shoes, and previously loved goods – a double landfill deviation! Plus these events feature live tunes, plastic-free living tips and marine talks, which all make for an afternoon of fun with the outdoor, ethically minded Dad in your life! No seaside scavenge near you? No problem! Organise your own, take your clean-up skills to your local beach, park or forest and make a difference while spending quality time together! If your adventure Dad couldn’t imagine any better weekend than to escape the city life and enjoy a night under the stars, we’ve got some gifts that will enhance his camping checklist. Sitting around a fire, or after hour meals, chats or card games are essential elements of the camping experience. Ever find yourself hunched over, uncomfortable or jealous of people who lugged along camping furniture? You don’t have to be anymore! Up your outdoor Dad’s camping game with a Thermrest Chair Converter. 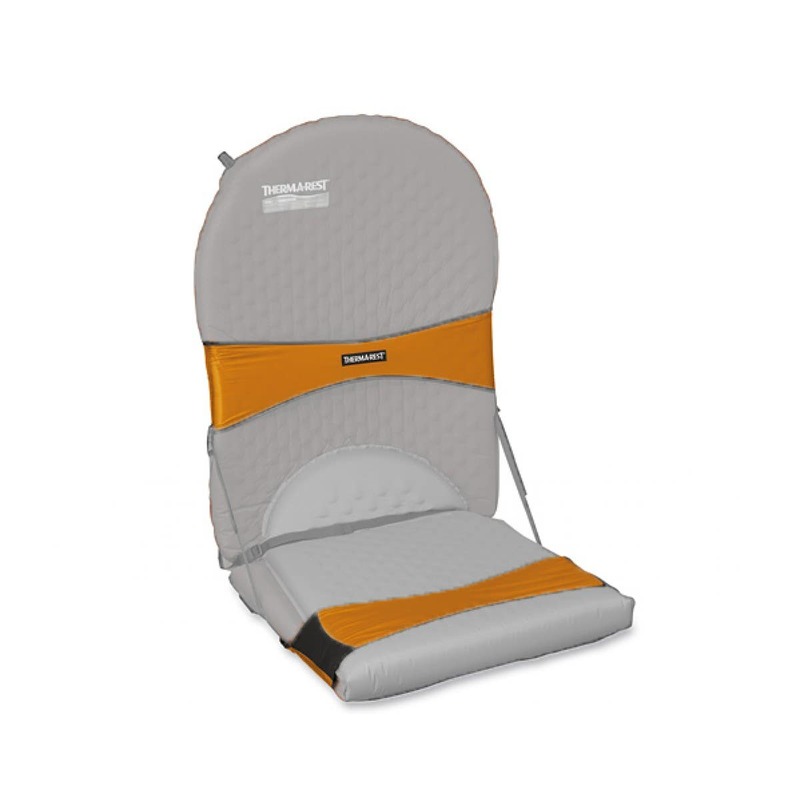 It converts a camping essential (sleeping mat) into a dual purpose item, allowing you to prop it up and use it as a comfy camp chair! At just 191 g, there’s no reason to deny yourself the convenience of a comfortable camp and travel chair. We’re thankful for all the Dads who love to cook up a storm under the stars, for the Dads who have taught us how to stay well fed on adventures, and for the Dads who took on the burden of extra weight so their families could enjoy camp meals and trail snacks! If your Dad is an outdoor chef, or an aspiring one, why not treat them to the top of the line cooking gear they deserve? 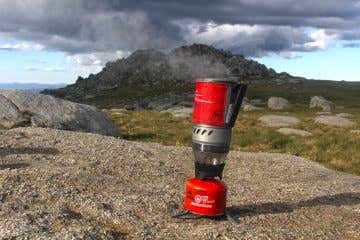 The MSR Quick 2 Pot System is a complete cook and eat system, designed as the go-to solution for the widest range of backcountry uses and meals. 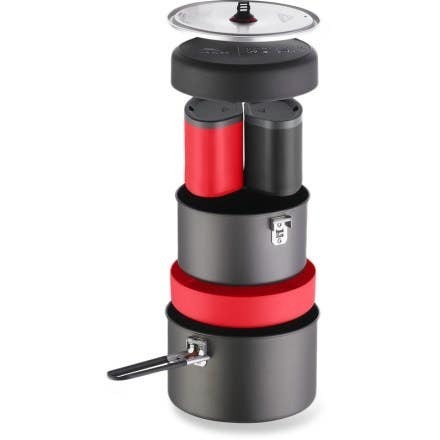 Insulated mugs and DeepDish™ plates combine with both nonstick and uncoated hard-anodized aluminum for the ultimate in lightweight, cook-anything utility! Socialsing at campsites can be made uncomfortable and irritating thanks to mosquitos – especially in certain seasons! Exofficio’s BugsAway® apparel is treated with Insect Shield®, giving you invisible, odorless protection just by putting on your clothes. The treatment binds permethrin to fabric fibers for the life of the garment, so it stays in your clothes—not on your skin—and lasts through 70 washes. It’s effective against ants, flies, chiggers, midges, and ticks, as well as mosquitoes, which can transmit insect-borne diseases such as Zika, Chikungunya, Dengue, and West Nile viruses. The ExOfficio BugsAway Chios LS Shirt Men’s is lightweight, easy to care for, quick drying and blocks up to 97.4% of UV radiation. Learn more about Exofficio’s insect repelling, temperature regulating, and sun protective apparel options here. 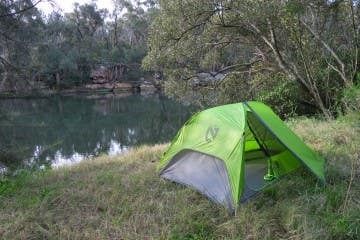 Another way to keep your camping bug free is with the Nemo Bugout Series. It sets up easily, like a tarp, but it does more than protect you from the rain. The Nemo Bugout creates an inviting bug-free zone for corralling kids and pets, and relaxing over food and drink. If you’re looking to bring a new level of comfort to your Dad’s camping kit, check out the Aeros Deluxe Pillow, where Sea to Summit lived by the idea that “bigger is better”. With this in mind, they designed a full sized pillow that’s still light, compact and portable enough to take with you into the backcountry. It’s an awesome and practical gift that won’t break the bank either! The pillow case is made from a 50D quilted polyester which whispers softness and comfort. Whether you’re on the road, in the campsite or in the backcountry, the Aeros range of lightweight and compact inflatable pillows will award the busy Dad in your life a comfortable sleep. For the Dads who are in the know about the outdoor technology that can up their training, travel, or adventuring routines! 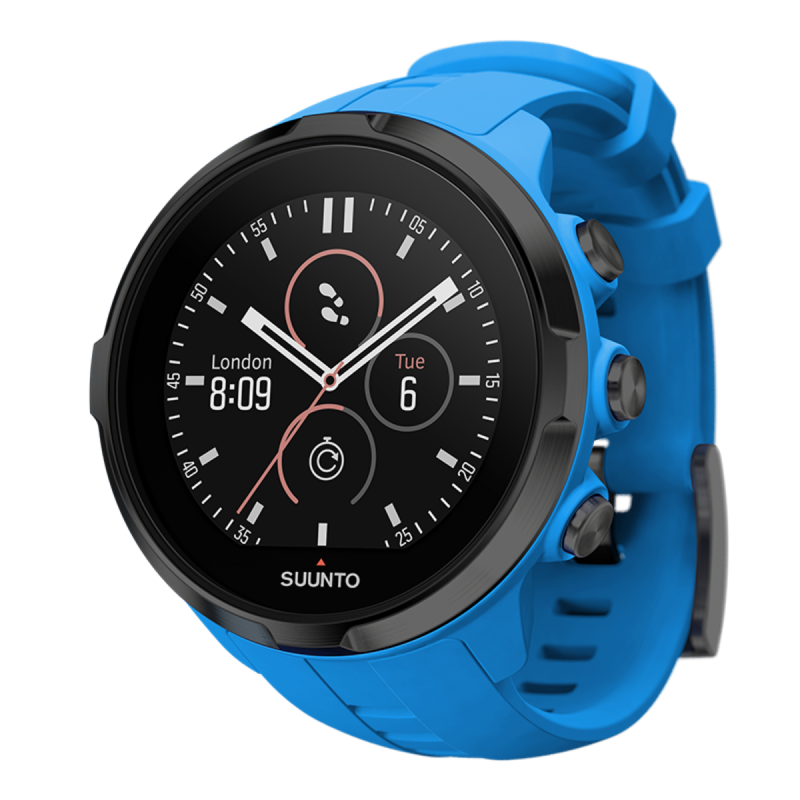 The Suunto line of watches offer sports precision instruments for training, mountaineering, skiing and more! These dependable adventure tools come in a wide range of options based on your needs and your price point. The Suunto Spartan Sport Wrist Heart Rate Monitor GPS Watch offers heart rate measurement, color touch screen, 100m water resistance and up to 12 hours of battery life. 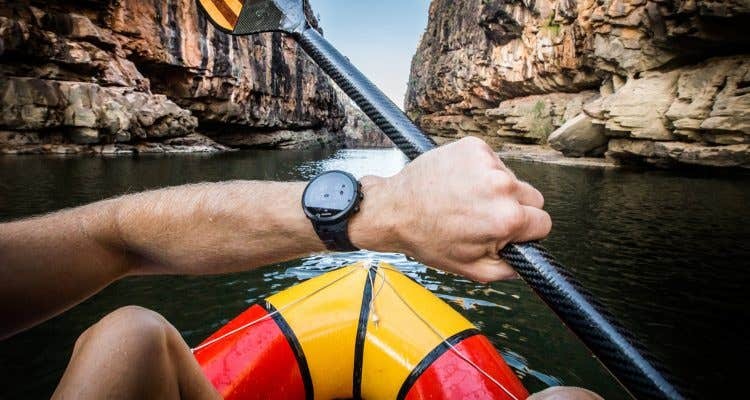 If you want to know more about training and adventuring with a Suunto watch, and what it has on offer, check out our blog on the Suunto Spartan Ultra here. 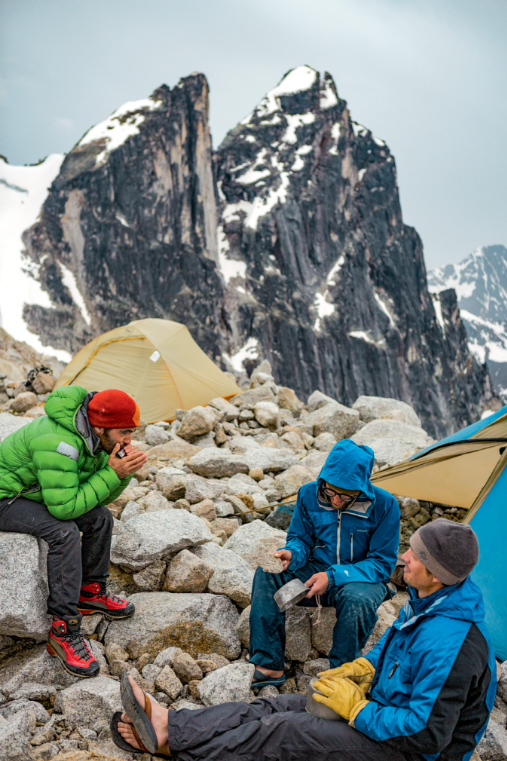 Staying hydrated enables us to adventure further, and stay out there longer. 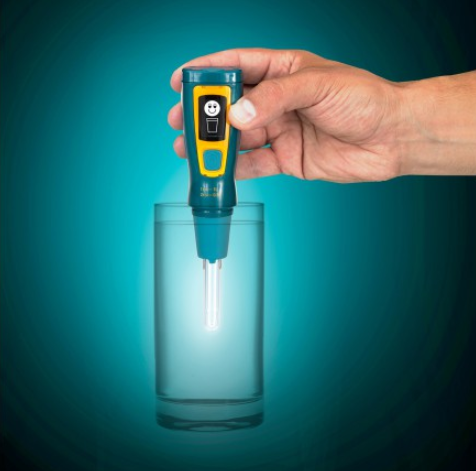 A Steripen Ultra UV Portable Wipen ater Purifier is a compact way to eliminate over 99.9% of bacteria, viruses and protozoa that cause waterborne illness; and it does it in just 45 seconds! Weighing in at only 140 grams, it’s a perfect addition to your adventure kit. Shop a range of SteriPen options at Paddy Pallin. Lastly, a Power Traveller is the perfect way to keep those gadgets in motion when on an adventure. There’s nothing worse than having lugged a camera, phone, watch, headlamp, or other portable electronic device and have it die on the way. Power Traveller offer a range of batter solution systems, including the 12000MHA Extreme Solar Charger which is a lightweight solar charger that opens to a 210 degree angle, optimising it to strap onto backpacks, tents or panniers for charging at all times! Here are some ideas that are big on functionality but low on price, for those of you who are on a budget but still looking to spoil the outdoor Dad in your life. GO Travel Clothes Line – This pegless travel clothes line allows you to dry garments almost anywhere while on an adventure or while travelling. Sea to Summit Pocket Shower – Nothing beats a good rinse after a long day. Have a cool shower straight away or take advantage of the black fabric that soaks in the sun during a day at camp to enjoy a warm shower in the early afternoon or evening. 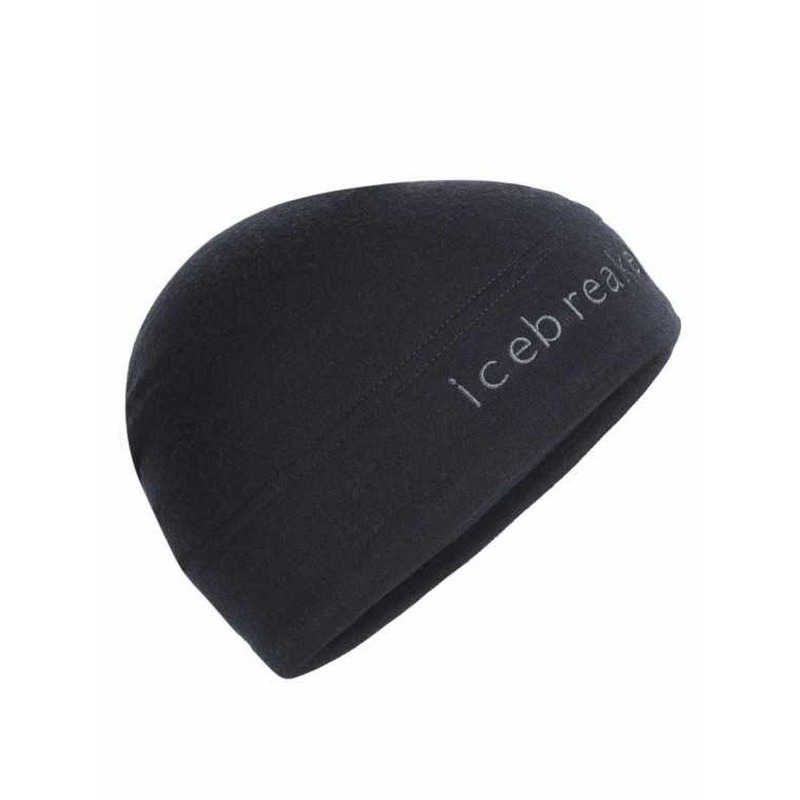 Icebreaker Mogul Beanie – Warm the extremities with this highly breathable, stretchy beanie. Not your Dad’s style? Shop all hats here. 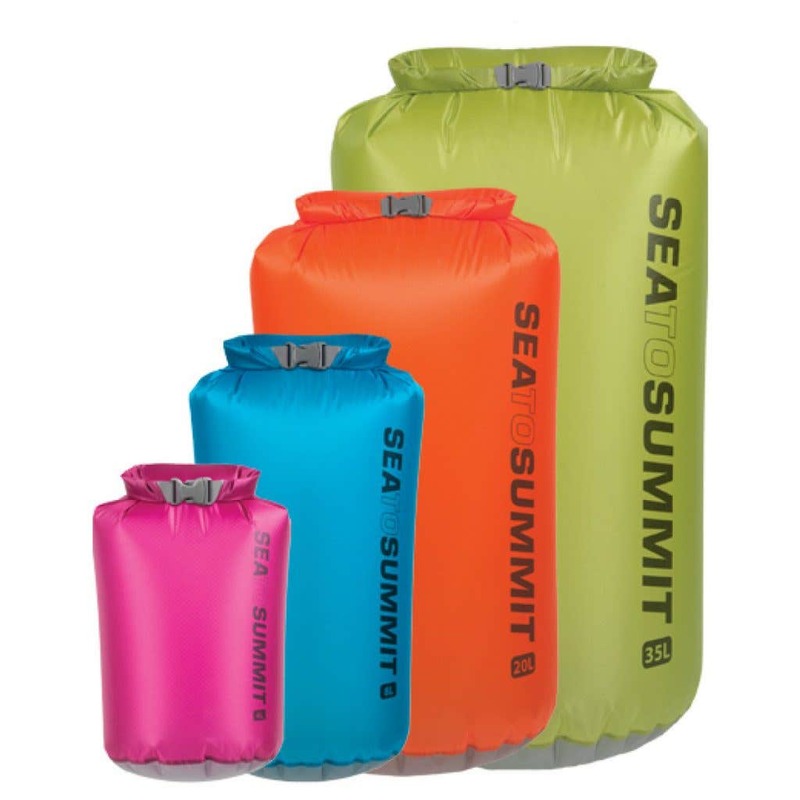 Sea to Summit Ultra-Sil Dry Bags – With a variety of colours and sizes, these gifts are the perfect, practical addition to your outdoor Dad’s adventure kit. With these lightweight options, there’s no longer a need to decide whether you keep your gear dry or you keep your pack light! Black Diamond Moji Lantern – Tired of shining headlamps in each other’s eyes around camp? 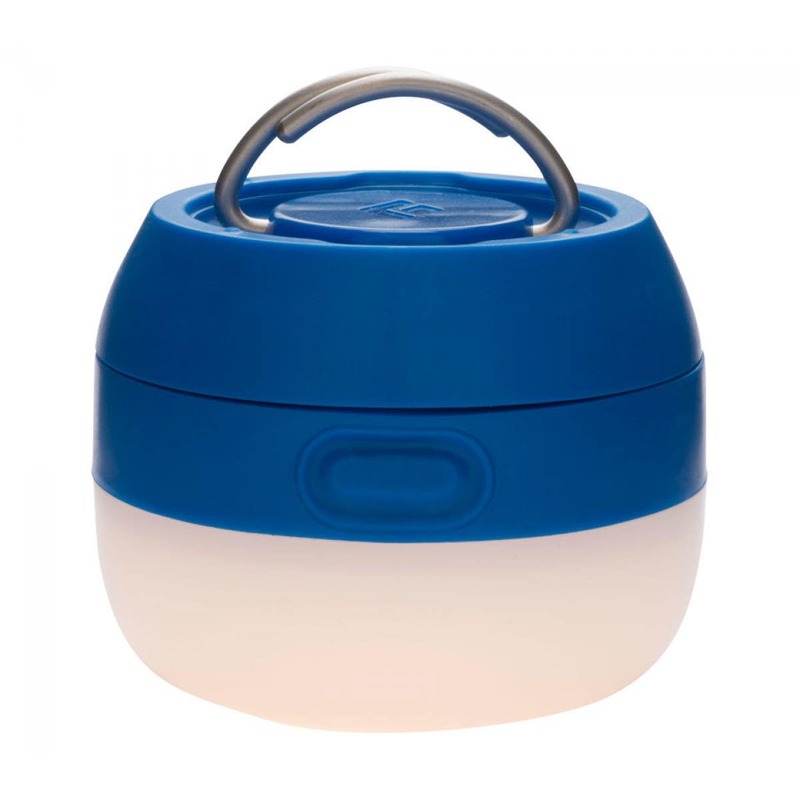 Illuminate your activities with this affordable lantern. If lanterns aren’t your jam we have a heap of lighting options that can be found here. Sea to Summit Pocket Towel – You can’t go wrong here. 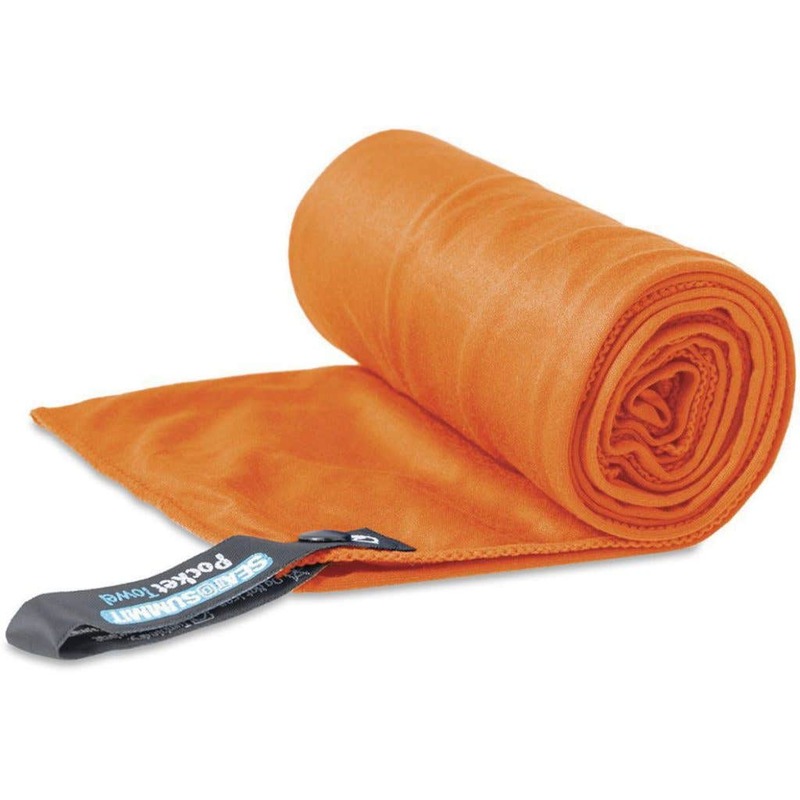 Whether it’s to dry off after a pumping adventure, towel off after a swim, or toss in your travel bag, this quick drying, absorbent towel won’t let you down. Nite Ize Doohickey 6x Key Tool – For a simple, creative solution to your Dad’s every day problems. Your Dad can take this tool with him everywhere. It works as a scraper, tape cutter, and scorer, a flat-head screwdriver and pry tool that’s perfect for opening paint cans. Wait, it doesn’t stop there! 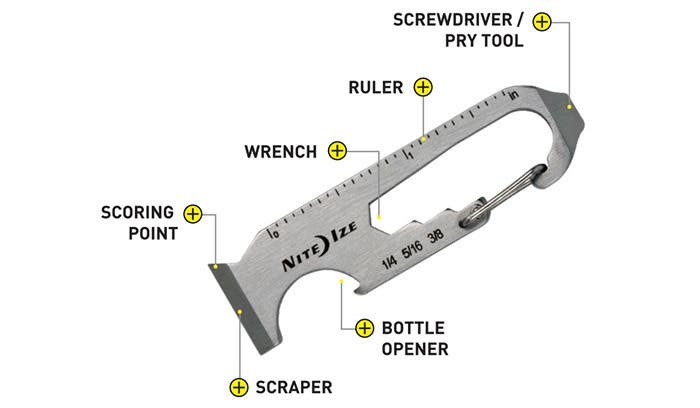 The outer edge is a ruler in both inches and centimeters, and not to mention a useful bottle opener, and a wrench (3 sizes!). 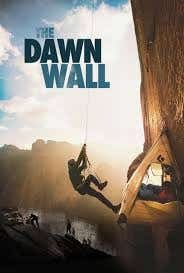 Take the outdoor Dad to one of the upcoming film tours/screenings coming to Australia. 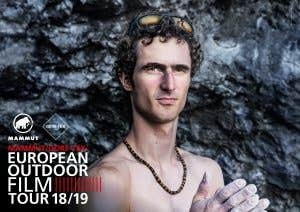 These could include Australian screenings of the Dawn Wall or the European Adventure Film Tour! Give the outdoor Dad in your life the gift of choice! 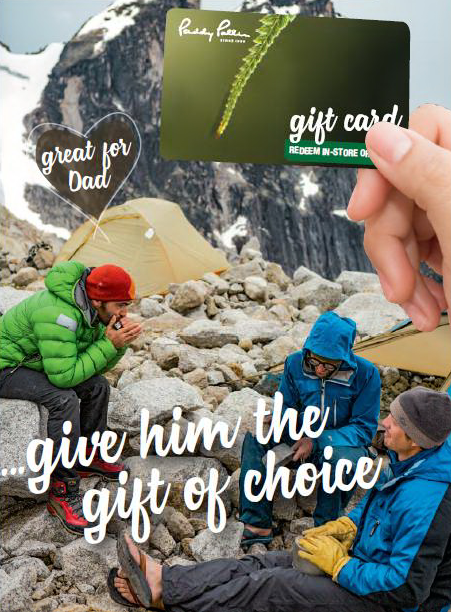 With a Paddy Pallin gift card, you can free his adventurous spirit by giving limitless options of gifts this Father’s Day. Happy Father’s Day to all Outdoor Dads! Don’t forget to share your Father’s Day activities with us on social media by tagging us on Facebook and Instagram or by using the hashtags below.